"Whatcom grown rye and potatoes, water, sea salt, and time. Baked on the battered outer cabbage leaves from our winter garden"
...which got me thinking if it was a thing; linning the baking tray with leaves, but have found very little. 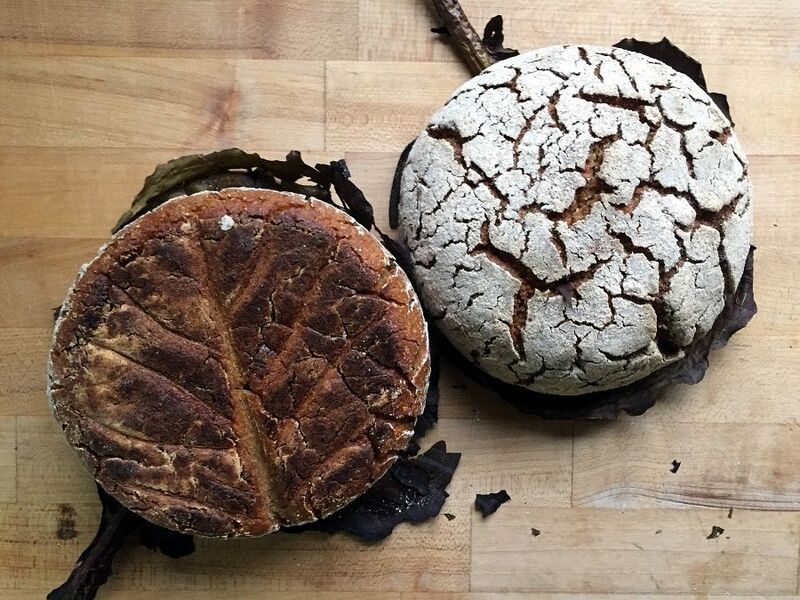 - OctoberFarm bakes smaller breads, with pictures and recipe. No flavour added from the leaves and seems mostly for the texture/design effect on the browning. - u/giveitago posted on reddit, "I experimented with lining baking pan with cabbage leaves", and great notes on how the baking and bread performed. - Lisa Keler wrote about Bibingka, filipino rice cakes baked in banana leaves. Where she says "there´s just something so unique and delicious about the flavours banana leaves give off. Maybe given the fact that the cakes are small allows the leaves to come through in the taste. I wonder if anyone has tried using vegetable leaves for wrapping dough or linning baking trays? I have not tried but vey intrigued to experiment. Some factors that could make a difference just by guessing are: amount of leaves, types of leaves, buttered or oiled leaves, seasoning the leaf lining before dough goes in, moisture given from the leaves, size of the baked product. I have lined the bottom of loaf pans with lemon scented geranium leaves when baking a lemon lb cake and that actually adds flavor, probably because of the oils in the leaves. Interesting idea. 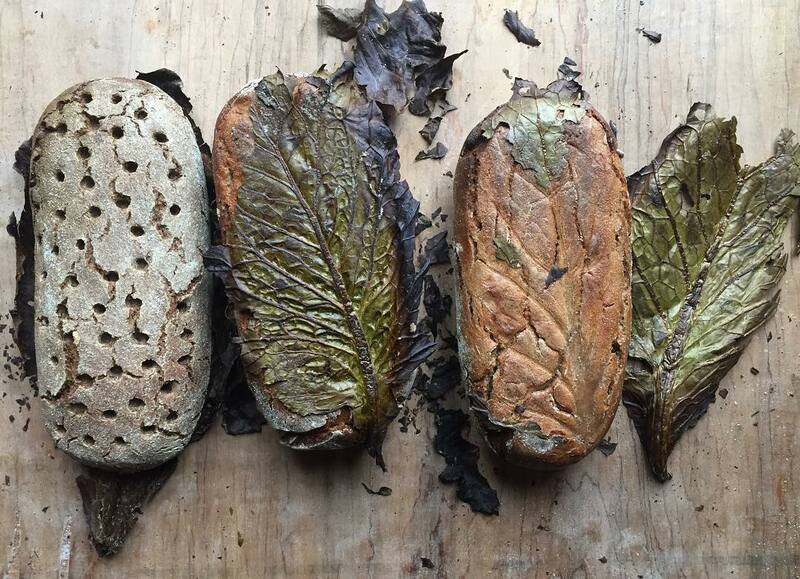 Many things are cooked in leaves but never heard of using cabbage leaves for breads. Lemon Scented geranium leaves sounds amazing. How was the flavour compared to the same recipe but no leaves? There are so many things cooked or steamed in leaves but not much baked, not that I can find. Still doing research atm. Kind of more herbal and floral. A subtle difference. Lemon verbena leaves work also. Just fun to bring the garden into baking. I liked the pattern on your loaves. Thomas Teffri-Chambelland teaches a course at SFBI. He makes a rye and cornmeal bread that's baked on cabbage leaves. Here is a clip of his process. It's pretty darn nifty.